Prunus 'amanogawa' is a gorgeous ornamental flowering, cherry tree first introduced in Europe around 1916 by the British plant collector Ernest ‘Chinese’ Wilson. The cultivar name 'amanogawa' means ‘River of the Sky’ in Japanese. What is referred to as the 'River in the Sky' is known as the 'Milky Way' to western astronomers. It is small and columnar in habit with extremely erect branches. It was first mentioned in 1886 in a list of trees which were planted along the Arakawa River near Tokyo. 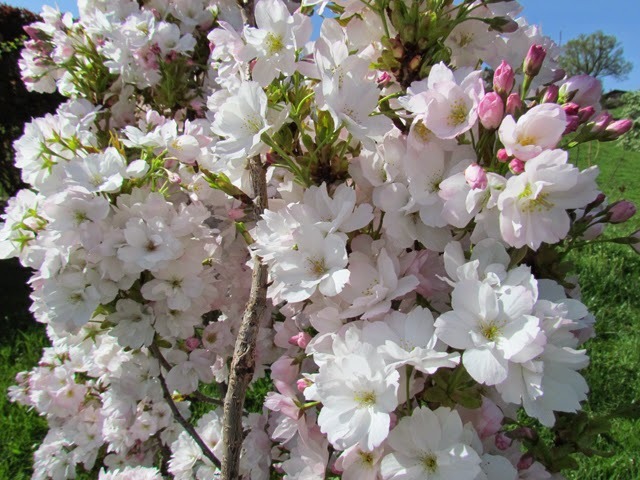 Commonly known in England as the 'Lombardy Cherry' it is noted for it dense, upright clusters of fragrant semi-double, shell-pink blooms which will appear between mid-April and mid-May depending on seasonal temperatures. The 'amanogawa' cultivar is believed to be Prunus serrulata forma erecta which makes it a member of the Japanese 'Sato Zakura'. This a specific group of extremely ornamental flowering cherries, some of which have been in cultivation for over 1000 years! Depending on conditions it swill grow between 4-8 meters tall and 2-5 meters wide. However to enhance its erect habit, errant branches can be carefully tied back into the main leaders. The mid-green, ovate-lanceolate leaves are arranged alternately on the stems and are 5–13 cm long and 2–7 cm wide with a serrate or doubly serrate margin. Like many ornamental cherries Prunus 'amanogawa' will provide a good display of autumn color with the leaves turning yellow, red or crimson before they drop. 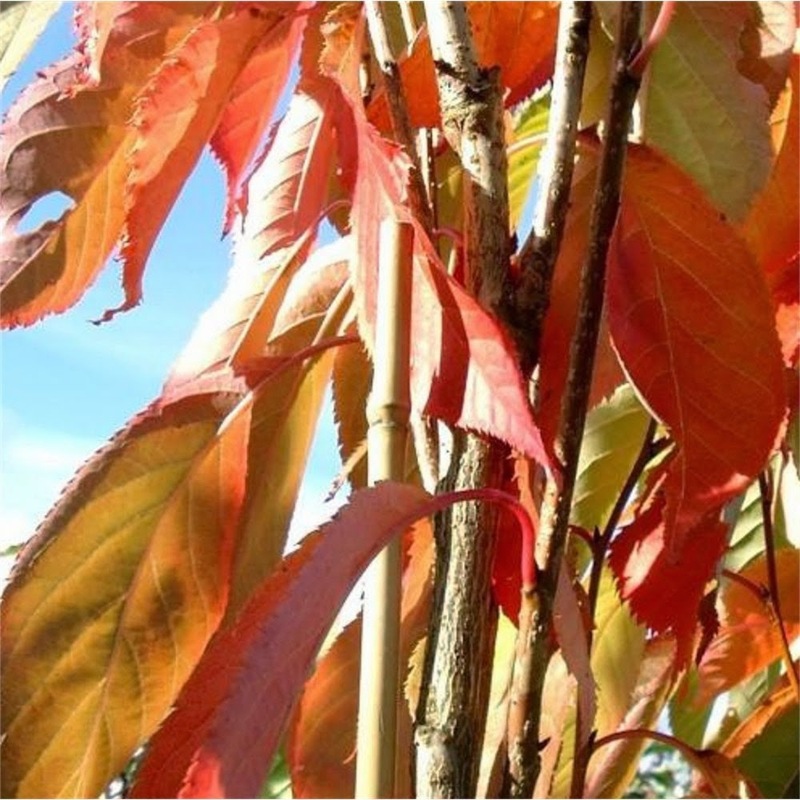 Like edible cherries, Prunus 'amanogawa' will be happy growing in most well-drained, garden soils, including chalk. Poor soils should have plenty of organic matter dug into the soil before planting.It will require a sunny position and the support of a stake for the first few years to prevent it from being blown over in strong winds. It is vegetatively propagated, and so in it is usually grafted onto Prunus avium roots. Keep the rooting area free of weeds and grass. In the spring, apply a mulch of well rotted manure or garden compost around the base of the tree, taking care not to mound it up against the stem. Pruning is unnecessary , but if it becomes unavoidable it is best carried out during late summer so that the cuts have a chance to heal before the onset of winter. 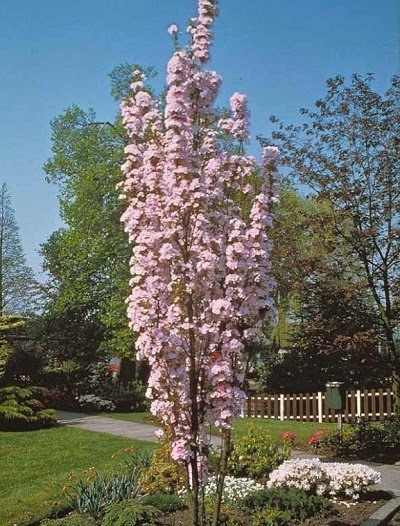 Prunus 'amanogawa' received the Award Merit from the Royal Horticultural Society in 1931.